American Robin in run-on song bout that began with an imitation of Eastern Kingbird. Normal singing posture is more relaxed and upright. Pencil sketch copyright David Sibley. On 5 April 2011 in Concord Massachusetts I was walking the edge of a field where I often go birding, and heard very distinctly the sputtering call of an Eastern Kingbird. It was about four weeks early for that species, and I assumed it was a European Starling mimicking from the trees above me, but when I heard the sound repeated four or five times in succession, with no other Starling-like sounds interspersed, I took notice. Looking up into the bare trees I found several American Robins, one of which was in an alert horizontal pose, and was clearly vocalizing but in an odd and unfamiliar pattern. The familiar song of American Robin is a series of relatively low, warbled phrases delivered at a steady pace. Often transcribed as cheerily, cheer-up, cheerio, chee-ridip. Typically 4-6 phrases are sung in rapid succession, then a brief pause about as long as one song phrase, then another set of 4-6 phrases, and so on. An individual phrase (like cheerio) is usually given once or twice in each set, used in several sets, then dropped for minutes. So as a Robin sings it works through its repertoire of phrases, only occasionally repeating a phrase twice in succession, but coming back to the same phrase repeatedly over the course of 30 seconds or so of singing. If we assign a letter to identify each unique phrase a Robin sings, the pattern would read something like this: ABCDB ACCD BDEEF FCGEHG and so on. Occasionally a much higher and more complex phrase is dropped into the sequence, sometimes transcribed as hissely, this has been called “whisper song” (although it’s not really analogous to whisper songs of other species) and a high breathy phrase like this often comes at the end of a Robin’s bout of singing. Nathan Pieplow has posted a summary with recordings of these variations here. What I was hearing from this robin was a continuous series of hissely-type phrases, much higher than the normal song, and the singing bout continued for over five minutes with only occasional brief pauses! There was also far more repetition of phrases than in typical song, in a pattern more like AABACBABABABCCDCDCEFEEFGHG… Finally, the bird was in an odd posture (shown in the sketch at right) unlike the typical Robin singing pose, perhaps threatening, but it didn’t obviously interact in any way with the few other robins nearby. This might be a “whisper” song. I’m a little more comfortable calling it a “run-on” song, but open to correction if anyone knows the proper terminology. After the initial imitation of Eastern Kingbird, the only other phrase that sounded like a copy of another species was a snippet of Wood Thrush song, although there were some phrases that sounded like they might have been “inspired by” Eastern Phoebe song, House Finch flight call, and perhaps others. 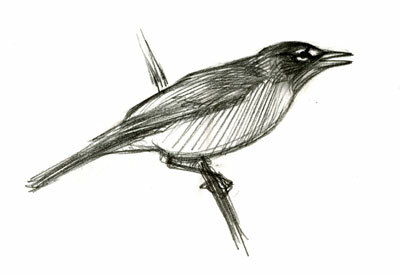 There was no repeat of the near-perfect copy of Eastern Kingbird later in the singing bout. The fact that American Robin occasionally copies other species is not so surprising. Constantine et al (2006) go as far as to say that “all passerines include mimicry somewhere in their repertoires”. And copies are more common in certain contexts, such as the unformed “practice” songs of immature birds. I find this particular American Robin intriguing, and I can think of several questions that I’d like to answer. Is this kind of song performance a rare occurrence, or is it a regular thing that I’ve just never noticed before? What is the behavioral context of the run-on song? Do Robins often incorporate copies of other species into this version of their song? Constantine, M. et al. 2006. The Sound Approach to Birding. The Sound Approach, Dorset, UK. Kroodsma, D. 2008. The Backyard Birdsong Guide: A guide to listening. Chronicle Books. I recorded a Robin doing this last year on March 28, 2010 — essentially the same time of year. The bird was very quiet, using almost all hissely phrases with occassional “bups” and “zzps” thrown in. At the time, I thought the ‘bups’ were from a 2nd Robin in the same tree, but the timing in the recording suggests to me it’s the same bird. IIRC, Kroodsma’s book brought my attention that hissely tends to be phased out as the morning grows older; then is used increasingly as evening wears on. So, this Robin caught my attention because it was 11:30am, and it was using almost all hissely. (4MB wav format available also for better spectrograms, just change the extension to .wav). Thanks for the comment and for the recording Eric. The bird I heard was singing a bit more rapidly, but it definitely sounds like the same type of song. I did record a couple of minutes of it just by holding up my iPhone, and I’ll try to get that edited and posted here. It’s interesting also that the one I heard was singing at about 9:30 AM, in the mid-morning “doldrums” – like yours – well after the more intense activity of early morning. At the following link is a recent recording of mine – an American Robin producing a series of quite loud “hissely” phrases. This was recorded mid-day; the bird was perched in a normal, upright posture while singing, and it was associating with a group of around 10 other robins. The other (silent) birds were both perched and foraging at the time. During fall and winter, I very commonly hear quiet “whisper-song” from robins, similar to the recording above, but quieter, and often given without the bill being opened. This “whisper-song” often sounds like a mix of “hissely” phrases and very high, thin versions of the usual clear song phrases. I recorded two American Robin individuals this morning singing here in MS, both of which mimicked other species. The first individual was singing the standard cheerily song but transitioned into a diverse set of syllables including hissely phrases. Within this set of rambling phrases were mimics of Carolina Chickadee calls. A second individual began singing only about 10m away and was only singing the run-on set of “random” syllables, usually repeating each about 3 times before moving to a new sound. This second individual began with a very nice pair of mimicked EAPH songs. I’d be happy to share these recordings if interested. They will be on X-C soon. I’m reading these comments because last night during nautical twilight I heard a robin imitating parakeet chatter. The person that lives next door to me has two of them and will put their cage outside on the porch when the weather is nice. The two of them happily chatter up a storm all day long. The parakeets had been brought back inside by then, but this robin was sitting in a tree next to that same porch. The song went on for quite a while. The robin would sing 3 “robin” notes then do a bit of parakeet chatter. Then sing the initial 3 robin notes again and do a different bit of parakeet chatter, and so on. It wasn’t a perfect imitation of a parakeet, but very, very good. I was so amazed by the performance, I Googled this morning to see if I could find out if Robins imitate other birds. Thanks for the comment Sue. Just for the record – what state/city are you in, and by “parakeets” do you mean Budgerigars? I’m guessing that the Robin you heard was in a more normal song performance (not the “hissely” phrases discussed above) and has simply heard the parakeets so much that it learned their sounds and incorporated those as part of its song. To speculate further… that robin might have been hatched in the neighborhood, so that it grew up hearing the parakeets during the critical phase of song development, and is now using those sounds as its own. For the past few days, in densely built Cambridge, MA, have been hearing what sounds, from the tone, unmistakably like a robin, but the song, delivered in full broadcast volume, is ABABA, with A higher than B. Have never heard this in our neighborhood before, and so far have not spotted the bird in the act of singing. Mysterious. 5/17/16 update: Finally spotted the bird in the act of singing: it IS an american robin. Now am trying to figure out who he is imitating. Sounds like an original song to me, but certainly am not an expert. Other robins don’t seem to be paying attention. Found this while googling whether robins mimic things, because lately at about 3:30 am I hear robin song that suddenly turns into a very convincing string of car alarms, and then back to usual robin song. NYC leads to some very interesting bird songs. I would like to report that vocal mimicry is particularly true for the Austral Thrush, which inhabits in in Chile and Argentina. I have records of at least 12 species mimicked, including birds of prey. Furthermore, several birders reported car alarm imitations in the cities. I invite you to check my Austral Thrush arcticle in the Sounds and Vocal Behavior of Neotropical Birds Online which will be published soon.